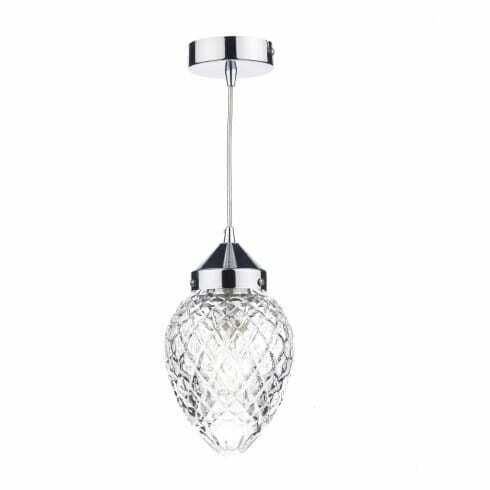 Dar Lighting Agatha single light ceiling fixture displays a clear, acorn cut glass pendant with patterns and bevels for an eye-catching image with light refracting prisms. The product code for this Dar ceiling pendant is AGA0150. The polished chrome metalwork and clear cable both compliment the contemporary look which is ideal for almost any area in the home. Height is adjustable at the time of installation only. Double Insulated. This pendant is also available in an antique brass finish for more traditional decors which may be ordered from our website.